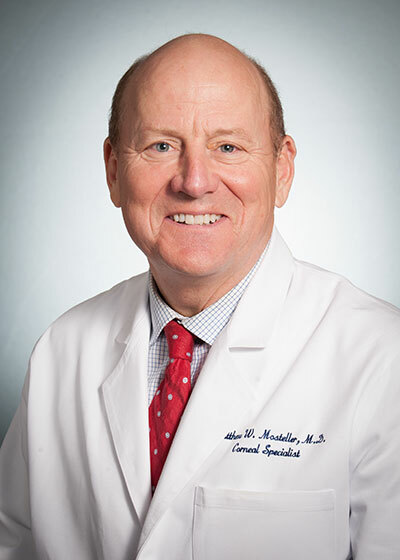 Matthew W. Mosteller, M.D. is a Diplomate of the American Board of Ophthalmology and has practiced his subspecialty of cornea and external disease of the eye at the Premier Medical Eye Group for over 25 years. Dr. Mosteller graduated from UMS Preparatory School in Mobile and then received a Bachelor of Science from Florida State University while on a fall NCAA swimming scholarship. He received his Doctor of Medicine from the University of Alabama School of Medicine and then followed that with an internship at the Baylor College of Medicine in Houston. He then excelled in his ophthalmology residency at the Ochsner Medical Foundation in New Orleans and next completed a post graduate fellowship in cornea and refractive surgery at the LSU Eye Center under the direction of the world renowned cornea specialist, Herbert E. Kaufman, M.D. Upon Dr. Mosteller’s return to Mobile, he became the first board certified subspecialty trained cornea and refractive surgeon in the Mobile area. Dr. Mosteller is a Diplomate of the American Board of Ophthalmology and the National Board of Medical Examiners. He is a Fellow in the American Academy of Ophthalmology and the American Society of Cataract and Refractive Surgeons. He is a member of the Mobile County, State of Alabama, and American Medical Societies. He is married to Cathy Hyman Mosteller, daughter of Dr. and Ms. Jack Hyman M.D. They have three children, Michael, Clifton, and Frances. Dr. Mosteller is the son of the late Dr. and Mrs. John H. Mosteller, D.D.S., and the brother of ophthalmologist, Dr. Charles S. Mosteller, M.D. In September of 2008, the Board of Trustees at the University of Alabama approved a resolution establishing the “Matthew W. Mosteller, M.D. Endowed Fellowship in Corneal and External Disease”. This endowed fellowship will provide a continuous source of funding to train cornea fellows in the department of ophthalmology at the University of Alabama School of Medicine in Birmingham. This tribute was established by the University in Dr. Mosteller’s name because of “his dedication to his colleagues, patients and his contributions to the advancement of corneal and refractive surgery.” As stated in the resolution, “this endowed fellowship in the honor on Dr. Matthew Mosteller is to support those young corneal fellows at the Department of Ophthalmology at the University of Alabama School of Medicine who aspire to follow in his footsteps in his commitment to excellence in the corneal surgery. This fellowship has created a lasting legacy in Dr. Mosteller’s name whose expertise and commitment to excellence as a renowned surgeon has touched the lives of many individuals and families throughout the South who have received renewed sight through his outstanding care”. Premier Medical is proud that this endowment was established in honor of one of their physicians.